Three mountains, three states, three people, three hours. 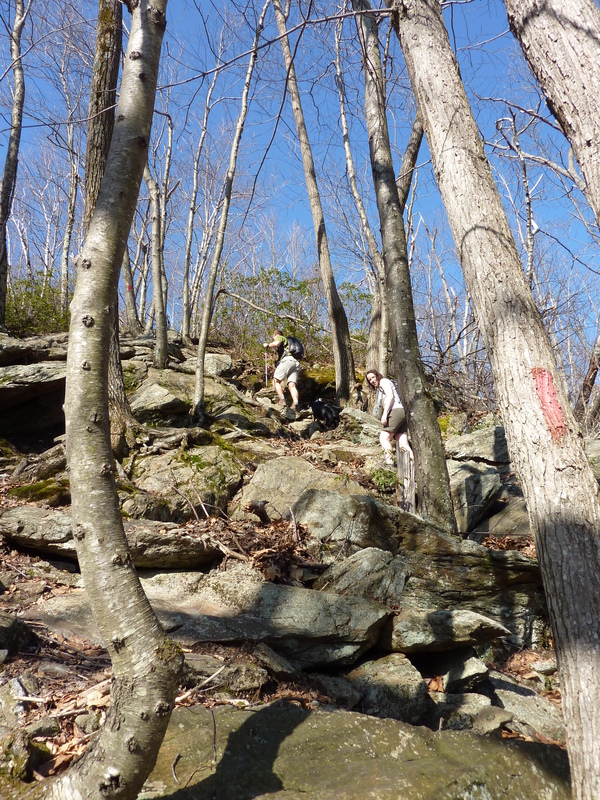 On the third day of April, three of us conquered Round, Frissell and Brace Mountain in Connecticut, New York and Massachusetts. Arriving at the trail head was an adventure. The unpaved road we drove for the last 1.6 miles was a slippery nightmare. The road was a slick mud pit, after days of devastating rain that hit New England in the past week. We weren’t sure if we would make it to trail head or slide off the road into a ditch and have to be towed out. We did make it to the trailhead and out again, though we witnessed one car that had the unfortunate experience of sliding off into a ditch and became mired in the mud. A piece of advice on this road, travel it in dry conditions. It was relief we tumbled out of the car and began the trek to our first summit of the day, Round Mountain. Mike and I hiked this in the fall and luckily forgot how intense and rock faceted the ascents are. The first .2 miles lulls you into a false sense of easy hiking, then bam….here come the ascents that are rocked based and steep. Up we chugged with many a catch your breath breaks along the way. 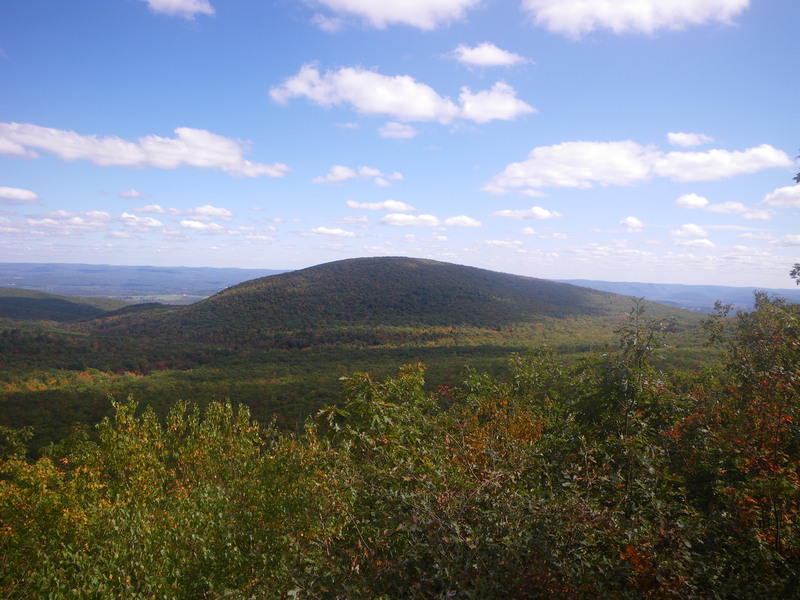 At the top of Round Mountain you are provided with views of Bear Mountain in Connecticut. After a brief break, we continued on and went around the bend of Round. 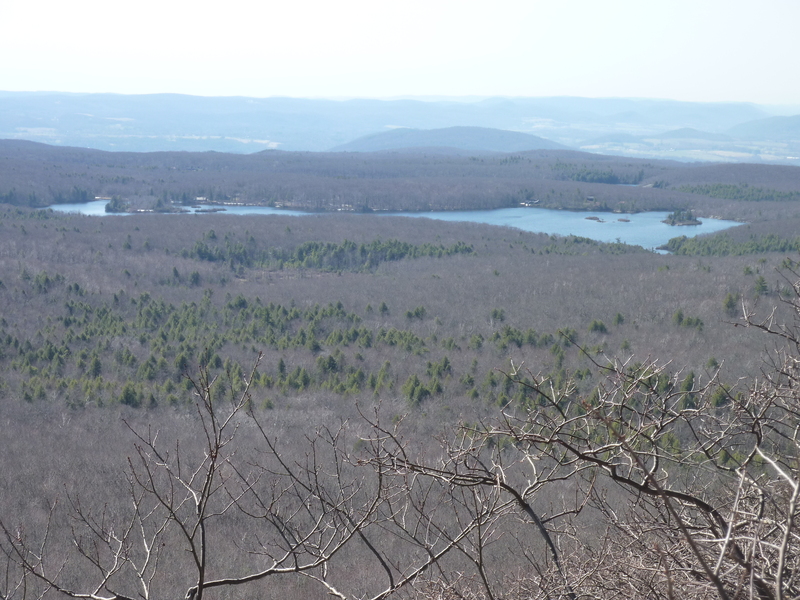 Before our descent, we were able to view Mount Greylock in the far distance and at one point you even catch glimpses of Riga Lake in Connecticut. We could also see where we had to go to reach Mt. 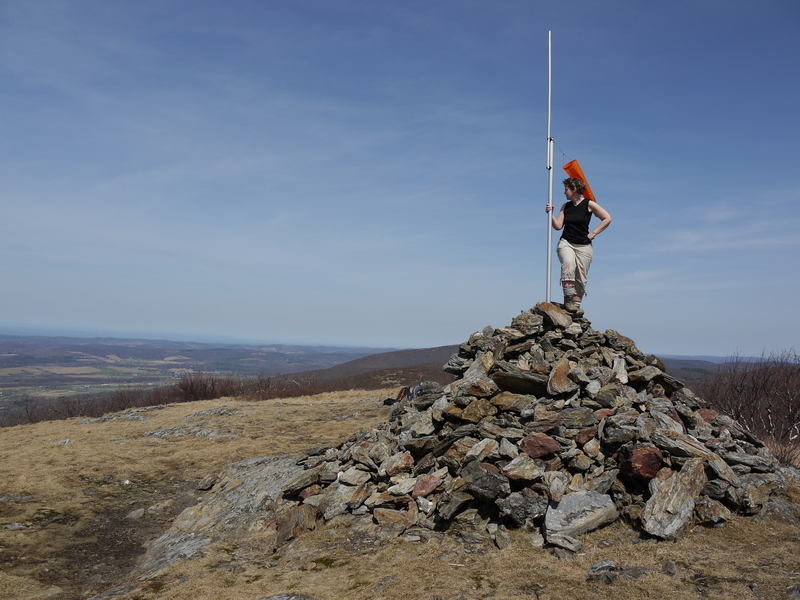 Frissell and the high point of Connecticut. The hike from our viewpoint appeared to be straight up and rock filled once again. 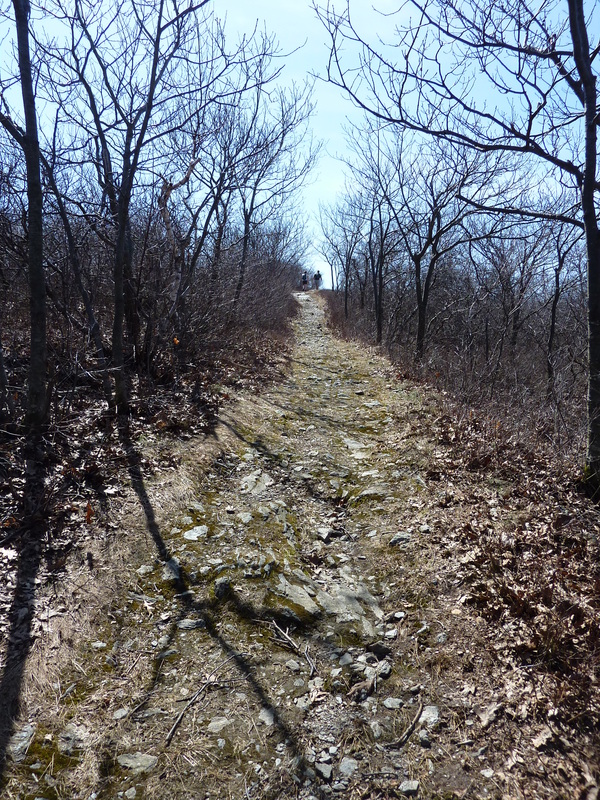 We began the climb down, while being serenaded by wood frogs. Then came the next ascent up to Mount Frissell. Up we traveled and then around a narrow path along the drop off. 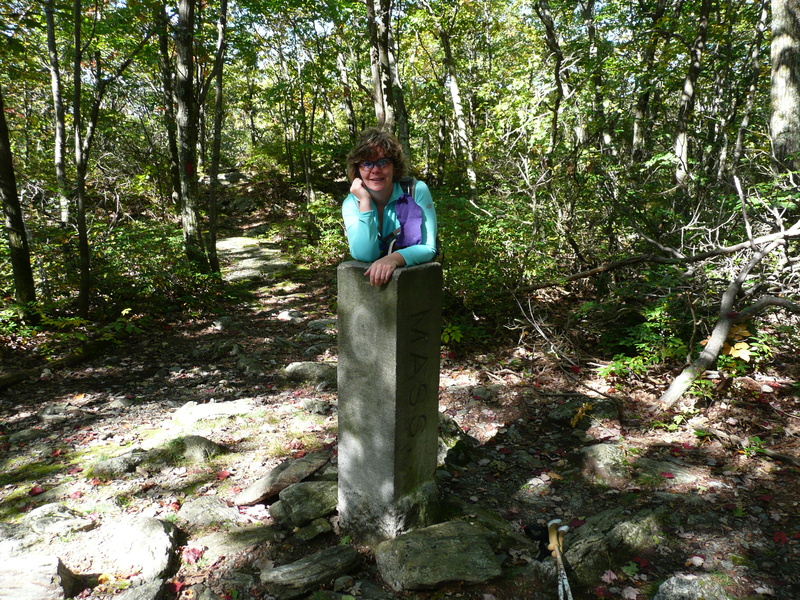 We discovered the marker of the high point of Connecticut and we spent time making it an official visit by taking photos. 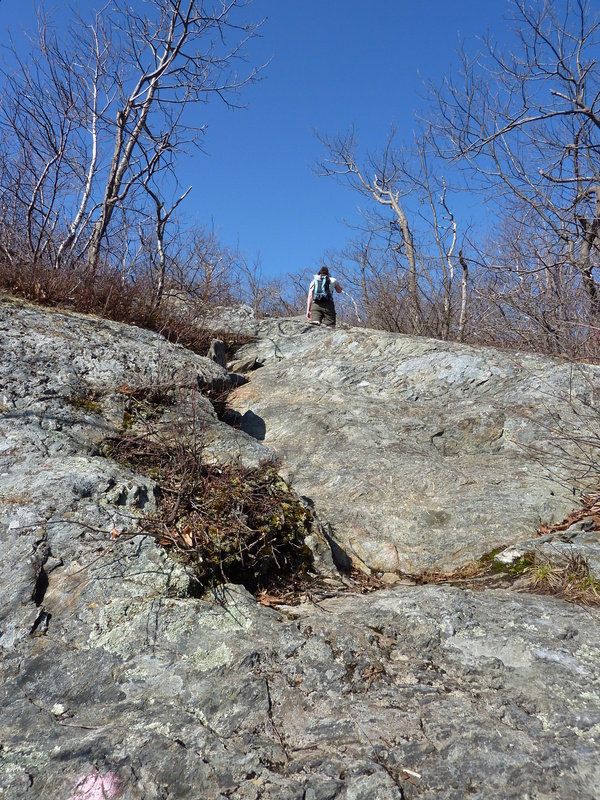 From here we headed down a rock slab to a trail surrounded by mountain laurel. 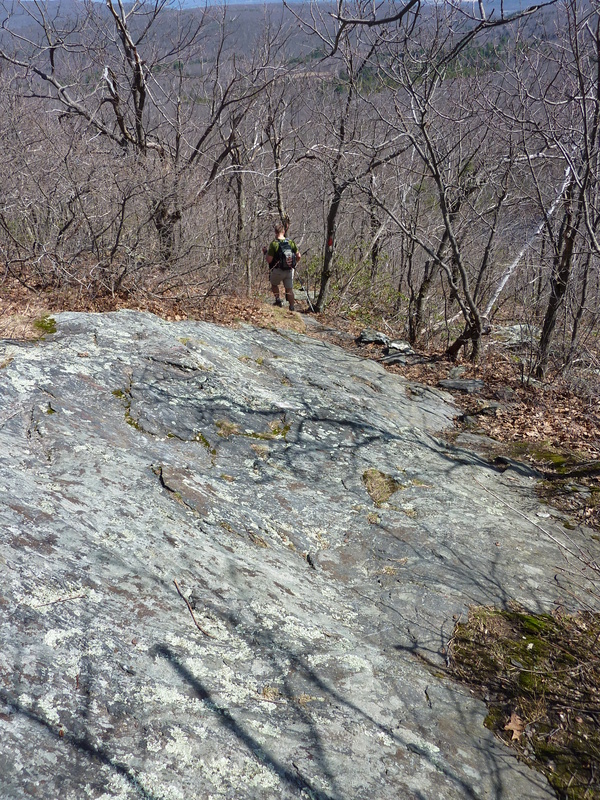 At this point we hiked to the tri state marker of Connecticut, Massachusetts and New York. 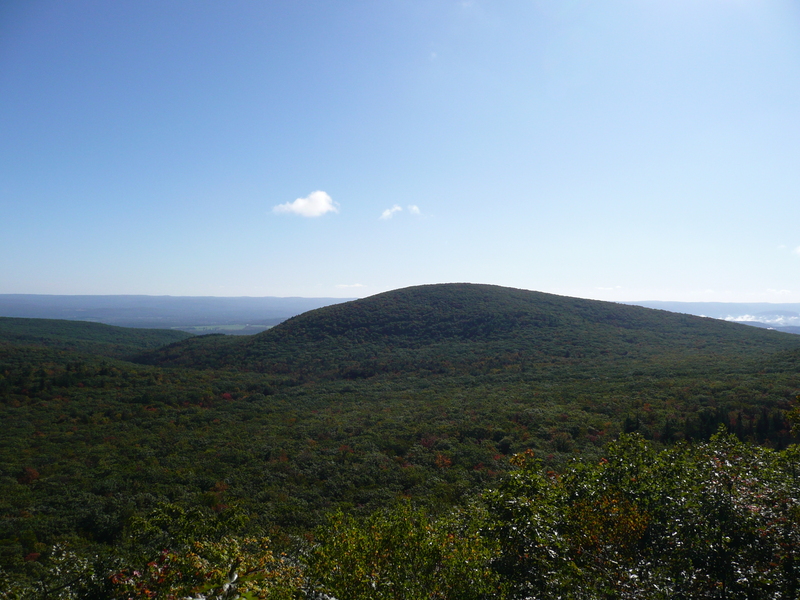 Connecticut doesn’t have its name carved on it. There are two stories behind that: One: CT was too cheap to carve their name in it or Two: CT. disagreed with the boundary marker. Take your pick as to which makes the better story. We then meandered to an open clearing where a few trails converged. We wanted to summit Brace Mountain, so we continued on. This was the easiest .4 mile ascent we’ve experienced on this trail. Once there we relieved ourselves of our packs and had a snack. We had a restful time on the spacious plain of the mountain and even climbed the cairn to ham for the camera. 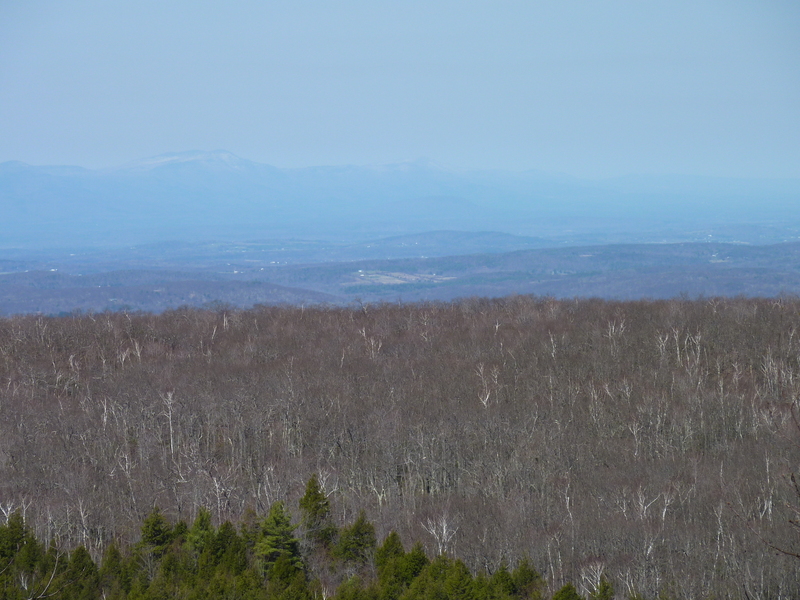 The views were stunning and even the Catskills were visible, still covered in snow. We packed up and headed back the way we came. The hike back seemed to go quicker, but the downhills seemed more taxing on our bodies, then going up them. One section we came up seemed so much steeper going down it. The three of us and Molly the dog realized this was demanding hike physically and mentally, but the views were worth it. We were three strong, climbing three mountains in three states on the third day. The details: We parked on East Road on the border of Massachusetts & Connecticut. This spring we came in on the Massachusetts side. In the fall we came in the Connecticut side. 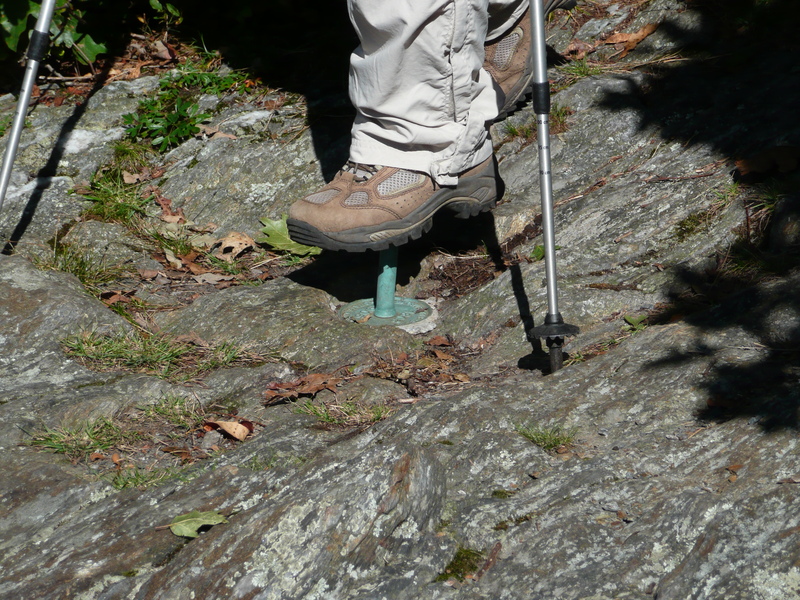 The trail was 4.4 miles out and back on the red trail markers. 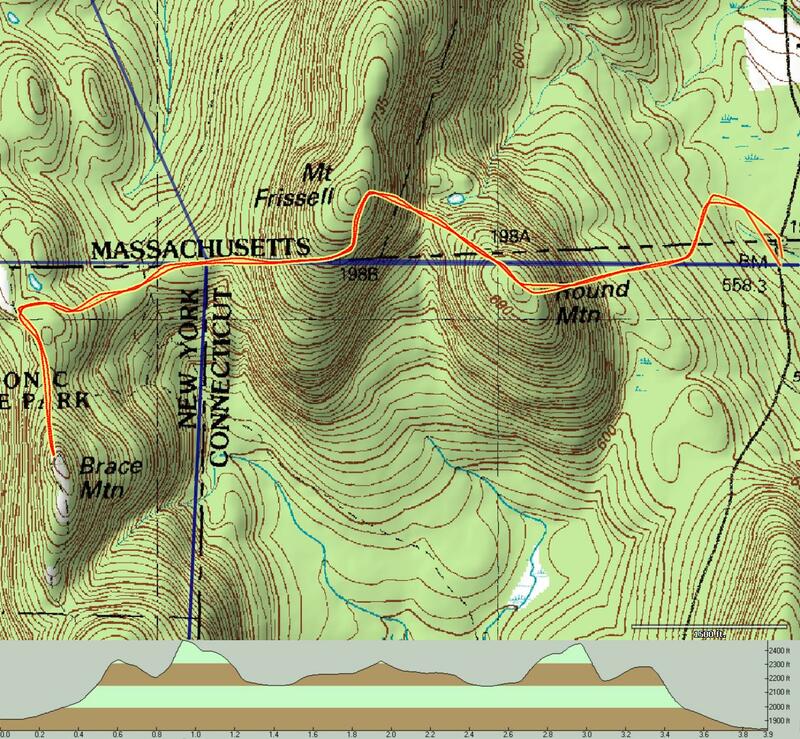 It is a physically demanding hike and you should be in shape. We spent a total of four hours on the trail, but three of that was moving time.